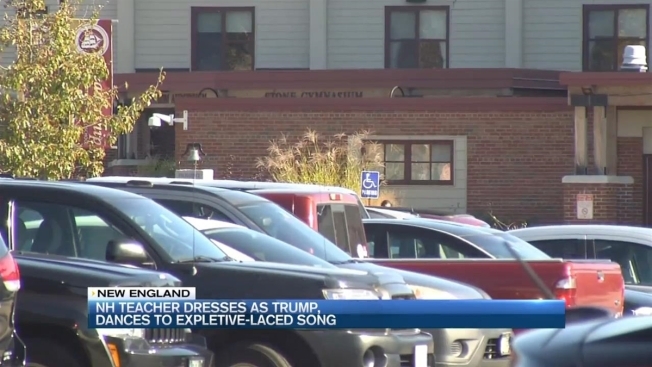 A New Hampshire teacher is not in the classroom after she posted a video on social media of herself dressed as Donald Trump while dancing and using an expletive. Portsmouth Superintendent of Schools, Stephen Zadravec, told Seacoastonline that Kara Kelley has been "taken out" of her classroom at Portsmouth High School and that he can't comment on the specifics of the incident. The paper reported that Kelley posted the video on some parents' Facebook pages on Monday showing her in a classroom dressed as the Republican presidential candidate. Zadravec told Seacoastonline that there is "no place for offensive language" in the school community and that the district doesn't support or discredit political candidates.